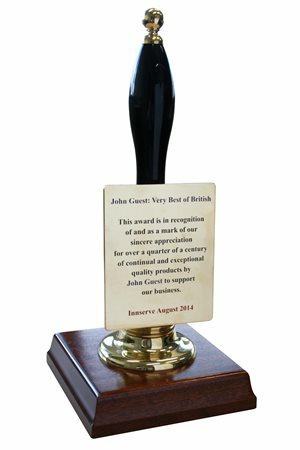 This award is in recognition of and as a mark of our sincere appreciation for over a quarter of a century of continual and exceptional quality products by John Guest to support our business. The award, which was presented by Paul Kane – Innserve Buyer/Health & Safety Manager and gratefully received on behalf of John Guest by Gary Hall – Divisional Director UK Special Products, is exceptional in that it is the only such award to have been presented by Innserve and therefore carries considerable sincerity and gravitas. Innserve will use in excess of 3 million John Guest connectors this year – and whilst being simplistic, John Guest connector reliability in performance & supply is critical to Innserve’s business and their ability to meet stringent customer performance expectations.